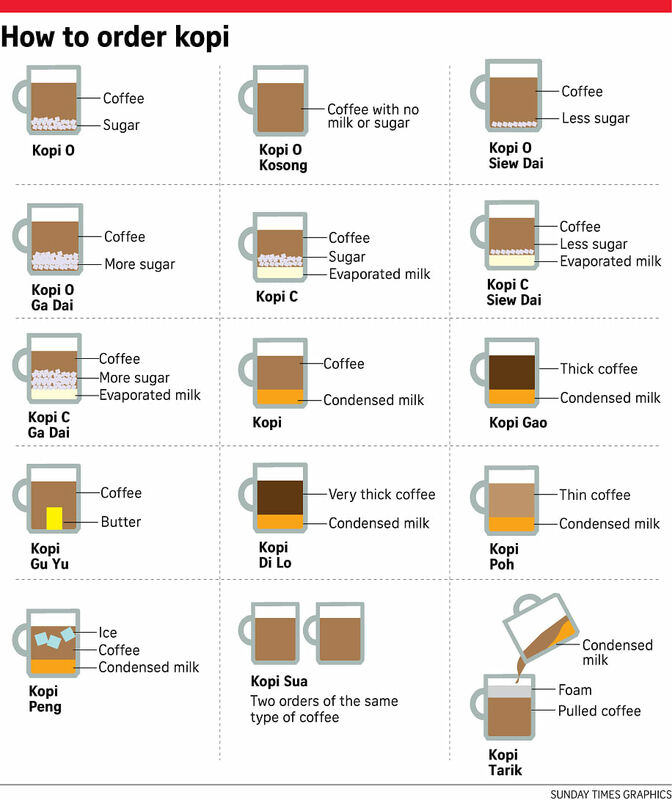 Order a traditional coffee at a local coffeeshop like a pro with these local kopi terms. Kopi-o kosong? Black coffee without sugar. Kopi-c: black coffee with evaporated milk and sugar. Artisanal coffee brewed in a wide range of methods, from pourover drippers to espresso machines, are all the rage in cafes. However, the humble Singaporestyle coffee, fondly known as kopi, is found in coffee shops across the island, where most people go for a wallet-friendly caffeine fix. Developed by Hainanese coffee shop owners here in the early 1900s, kopi gets its kick from Robusta beans roasted with sugar and butter. The ground coffee is then mixed with hot water before being strained in a flannel sock filter. It is then customised with sugar and condensed or evaporated milk. Despite the influx of Western coffee chains and cafes here, Mr Thomas Foo, 64, chairman of the Kheng Keow Coffee Merchants Restaurant & Bar-Owners Association, says the popularity of kopi is strong, with 200 to 300 cups sold daily at each coffee shop. He says that while the number of coffee shops has dropped by up to 10 per cent over the past two years due to rising rent and manpower costs, kopi sales have been consistent. He says: "Kopi is still popular as it is cheaper than having coffee in a cafe. The drink is tailor-made to how thick or sweet people want it to be and the kopitiam is a homely place where shop assistants address regulars by name." The association has more than 300 members who run coffee joints in hawker centres, foodcourts and kopitiams. Mr Foo has noticed that a growing number of coffee shops are using the more prized Arabica coffee beans from countries such as Mexico and Brazil and charging up to $10 for a cup of coffee. "We need to keep up with the times to attract younger customers who are more willing to spend money to customise their cuppa." Coffee aficionados can find out more about the rich kopi heritage at the inaugural Singapore Coffee Festival. Held from June 9 to 12 at the F1 Pit Building, the event celebrates Singapore's vibrant coffee culture. It is organised by Sphere Exhibits, a subsidiary of Singapore Press Holdings, presented by DBS and hosted by The Straits Times. Besides learning about cuttingedge barista skills, coffee gadgets and latte art from more than 100 exhibitors, visitors can taste and find out about kopi at the Local Kopi Area at Paddock 2 on level three of the F1 Pit Building. Visitors can enjoy kopi, tea and Doffee, coffee or tea topped with a doughnut, from home-grown chain Killiney Kopitiam. They can walk down memory lane and pose against a photo montage wall of scenes from kopitiams of yesteryear with classic marbletop tables and wooden chairs. Kopi lover Peggy Lim, 29, a civil servant who is planning to attend the festival, hopes to buy both kopi and speciality coffee beans at the event. She drinks at least one cup of kopi o siew dai (black coffee with less sugar) daily, a habit fuelled by her family's kopi-brewing practice at home for 20 years. She says: "Compared with a cup of long black coffee, kopi o siew dai is less acidic and bitter. It has such a familiar taste and makes a good drink all day long." It may be turning 100 in three years, but Killiney Kopitiam is showing no signs of slowing down. The kopitiam chain, which has 33 outlets here, is famed for its Hainanese-style kopi, kaya toast and local dishes such as curry chicken, mee siam, mee rebus and laksa. To keep up with the craze over Instagram-worthy food, it will be debuting its Killiney Doffee ($4, left) at the Local Kopi Area at the Singapore Coffee Festival. The drink is kopi or tea topped with a kaya-glazed doughnut injected with a syringe filled with melted butter, white coffee syrup or kaya. The concoction will be available only at the four-day festival. Killiney Kopitiam's booth will also sell coffee and tea. Its director Woon Tek Seng, 68, says: "We are building on our firm tradition of kopi and kaya toast and developing innovative food products and dishes that can appeal to the younger crowd." The chain has branched out into producing instant white coffee mix, which will be sold in some FairPrice supermarkets from next month, and has rolled out eight ready-to-cook pastes for dishes such as laksa, mee siam and chicken curry, based on its popular menu items. Killiney Kopitiam general manager Henry Oh, 42, says more young entrepreneurs in their 30s are taking up franchise opportunities with the chain and giving the interiors of their outlets a modern makeover. He says: "They are familiar with time-proven local kopi and dishes and want to present them in a hip and modern way." Despite the crowded coffee scene, Mr Woon says business has not been affected. "We have been expanding, with about 10 outlets opening here in the past two years. There's still a market for kopi as Singaporeans grew up with this flavour." The chain sells more than 49,000 cups of kopi here daily and also has franchises in seven countries, such as China, Australia, Indonesia and, most recently, Myanmar, where its first outlet opened last year. Its in-house roasted kopi is made with a blend of Arabica beans from Colombia and Robusta beans from Indonesia. The beans are roasted with butter, sugar and "other secret ingredients", adhering to the recipe that was passed down to Mr Woon when he bought the coffee shop in 1992 for $680,000. Then a forex trader, he used to go to the coffee shop, previously known as Kheng Hoe Heng, in Killiney Road for kopi C and kaya toast for 16 years. He later found out that its old Hainanese owners were looking to sell the shop and bought it to preserve Hainanese food culture. Asked what he thinks is the enduring appeal of kopi, Mr Woon, who is Hainanese, says: "It lies in our blend of coffee beans. It has a strong and fragrant aftertaste that can last up to one hour in your mouth." Despite growing up in his father's coffee supply shop, it was not love at first sight for Mr Jacob Tan (left) when it came to coffee beans. His father Tan Tiong Hoe, 73, ran Tiong Hoe & Company, which supplies roasted coffee beans to coffee shops and eateries. It started as a home business in the 1960s and operated from a shop in Stirling Road from 1975. The shop moved to its current location in the same estate in the early 1990s. Starting from when he was a teen, he would help out at the shop during the school holidays, packing coffee beans and making deliveries. The 34-year-old, who has four older sisters, says: "At such a young age, my siblings and I were not intrigued by coffee. It was just a bitter liquid to us." Over the years, his interest in coffee grew as he was exposed to "every single aspect of the coffee business", from roasting beans to repairing machines. He developed a passion for coffee when the shop started selling coffee machines. That spurred him to quit his job as a logistics manager in 2002 to take a more active role in his family's business. "The new technology made the job more interesting as there were more ways to experiment and extract better flavours." Tiong Hoe & Company was started by the senior Mr Tan when he was 20. He had been eager to start his own coffee roasting business after a three-year apprenticeship at the now-defunct Dutch coffee trading company Mirandolle Voute & Co. He built his business around Hainanese-style kopi, Indonesian Robusta beans roasted with sugar and butter. When speciality coffee beans sourced from all over the world became popular in Singapore, the younger Mr Tan decided to carve out a 600 sq ft section of the shop for Tiong Hoe Specialty Coffee in 2014. The shop supplies speciality coffee beans to close to 30 cafes. His family also operates another company, Fresh Cafe, a wholesale distributor of commercialgrade coffee beans, kopi and coffee equipment. "There was a timely need to cater to market demand for drinking coffee in new ways and I can build on my father's coffee knowledge and skills," Mr Tan says. The 20-seat cafe serves brews and sells 30 singleorigin beans as diverse as Geisha beans from Panama. Prices of the single-origin roasts start at $13.50 for 250g of the Gachala house blend. Some of the speciality coffee packs will be sold at the festival. Asked why he wants to continue his family's coffee business, Mr Tan says: "Since my father started something, it would be a waste not to build up on his efforts."